A diagnosis of anhidrosis is very unwelcome news, especially for a performance horse. During hot weather or hard exercise, horses with anhidrosis will not sweat. Sweating is essential for a horse to cool its muscles and internal organs. A horse that is not sweating will quickly overheat and be in danger of heat stroke. This condition is rarely seen in horses that live in temperate climates. In fact, horses that already have anhidrosis will be more comfortable if they are moved north where long bouts of hot, humid weather are less likely. Anhidrosis is also known as 'dry coat syndrome' or 'non-sweating disease'. In its early stages, it's known as 'puff disease' because horses pant heavily, even after work ceases, as they try to cool themselves. 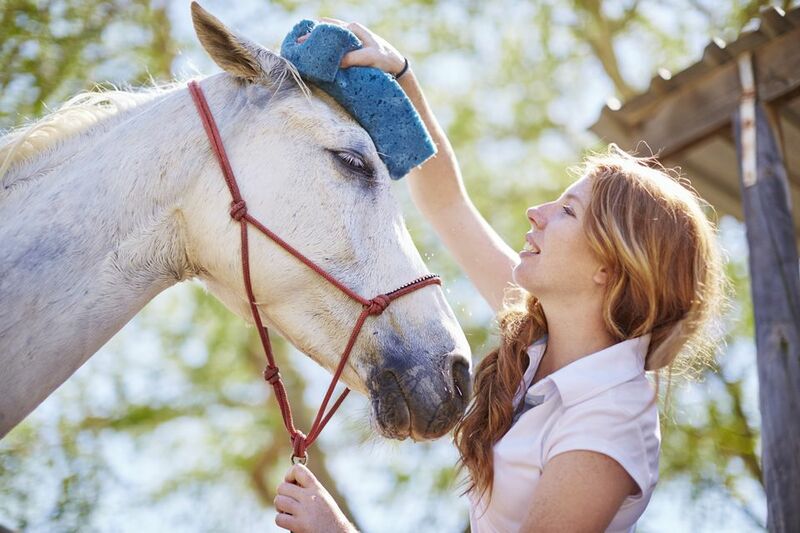 Horses will have very little, patchy or no sweat, elevated pulse, and a higher than normal body temperature when worked or when the weather is hot enough that most horses sweat while just standing. After exercise, recovery is slow. The horse may also have flaky dandruff and coat loss. A thin coat can be an early sign of the condition. The horse may appear distressed or lethargic during periods of hot humid weather, even if it is not working. The condition appears most frequently where temperatures and humidity stay high for lengthy periods of time. The cause is not known and the onset can be startlingly sudden. It's more often seen horses living in tropical or very humid climates such as the southern states. The horse’s sweat gland become over-stimulated and the stress glands may cause them to malfunction. The result is a horse that sweats very little, or not at all. Sometimes, an owner will notice that the horse does not perform as well in hot weather and its respiration rate stays higher than normal after exercise. Its body temperature, measured with a rectal thermometer may also be slightly elevated. How Can Anhidrosis be Controlled? Keep horses with anhidrosis as cool as possible during hot, humid weather. Employ cool mist, sponging, fans, shade or stall rest to keep your horse as comfortable as possible. If you must work your horse, take advantage of cooler morning or evening temperatures. Don't work your horse during times of high heat. Consider moving your horse to an area with a cooler climate. Or, keep work to a minimum during the hottest weather, and schedule your shows and events for the times of year when it’s less likely to be hot. There is some anecdotal evidence that acupuncture can be beneficial. As we learn more about this condition and recognize its signs, better treatment has been developed. A home treatment was to feed the horse beer. While this may have worked for some, over time it may not be the best strategy. Horse owner Jayne Pedigo describes her experiences with anhidrosis. The product that Jayne recommended and seems to be used by many owners with success is The One AC. The One AC can be purchased through Horse Solutions. Some success has also been found using electrolytes. In addition to The One AC, you may wish to try True Sweat®, Platinum Refresh® or Equiwinner. The One AC from The Magic Powder Co.
A blood sample analyzed by your veterinarian can help determine the best supplement for your horse. Keep in mind that no supplement has been proven 100% effective with all horses. You may have to try different ones, combined with changing your turnout and riding habits. A horse that is lightly ridden may not be too affected by anhidrosis, but it could be career ending for a horse competing in something like horse trials or endurance riding.